This animated GIF shows a sequence of radar amplitude images that were acquired by the Agenzia Spaziale Italiana CosmoSkyMed satellite system. 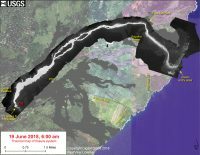 The images illustrate changes to the caldera area of Kīlauea Volcano that occurred between May 5 and June 18 at about 6:00 a.m. HST. The satellite transmits a radar signal at the surface and measures the strength of the return, with bright areas indicating a strong return and dark areas a weak return. Strong returns indicate rough surfaces or slopes that point back at the radar, while weak returns come from smooth surfaces or slopes angled away from the radar. 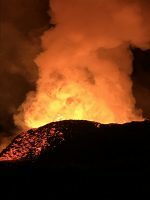 Over time, expansion of the summit eruptive vent within Halema‘uma‘u crater and the widening of Halema‘uma‘u itself are clear. The last five images in the sequence, from May 29-June 18, show the development of several cracks outside Halema‘uma‘u (also seen in recent UAS footage of the crater) and inward slumping of a large portion of the western, southwestern, and northern crater rim. Much of this motion appears to be coincident with the small explosions from the summit that have taken place on a nearly daily basis over the past 3 weeks. 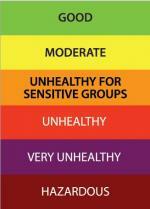 We expect this slumping to continue as long as the explosions and overall subsidence persist. 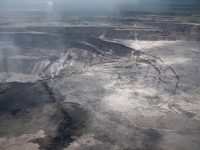 Geology field crews on the ground near the Kīlauea’s fissure 8 midday on June 19, 2018 observed a still-vigorous channelized lava flow being fed by lava fountains at the vent. Standing waves are visible within the channel. Cascades/rapids are visible near the base of the cone, which is an estimated 50 m (164 ft) high. The maximum flow velocity in the channel is 7.7 m/s (17 mph). During the morning overflight, several small overflows could be seen along the channel margins. The flow of lava is more rapid in the center of the channel and decreases in speed toward the margins where friction with the channel walls increases. The lava flow forks as it nears the ocean, creating two ocean entry points. Video taken Tuesday, June 19, 2018 courtesy of U.S. Geological Survey. Map as of 1:00 p.m. HST, June 19, 2018. Given the dynamic nature of Kīlauea’s lower East Rift Zone eruption, with changing vent locations, fissures starting and stopping, and varying rates of lava effusion, map details shown here are accurate as of the date/time noted. Shaded purple areas indicate lava flows erupted in 1840, 1955, 1960, and 2014-2015. 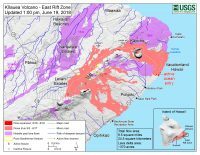 This thermal map shows the fissure system and lava flows as of 6 am on Saturday, June 19. The fountain at Fissure 8 remains active, with the lava flow entering the ocean at Kapoho.The channel is very full and is overflowing to produce short pahoehoe lava flows that overtop the levees. Very small, weak spattering and short flows have been active near the Fissure 6 area. The black and white area is the extent of the thermal map. Temperature in the thermal image is displayed as gray-scale values, with the brightest pixels indicating the hottest areas. The thermal map was constructed by stitching many overlapping oblique thermal images collected by a handheld thermal camera during a helicopter overflight of the flow field. The base is a copyrighted color satellite image (used with permission) provided by Digital Globe. This is a Civil Defense Message for 6 p.m., Tuesday, June 19, 2018. 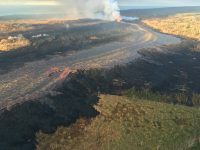 Hawaiian Volcano Observatory reports that Fissure 8 continues to erupt with a full channel flowing to the ocean at multiple points. Fissure 15 has mild spattering and Fissure 6 is oozing. 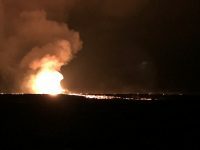 The National Weather Service says light winds overnight will push emissions into the interior of the Big Island, including Hilo, northern and western parts of the Big Island. Tradewinds are expected to build by Thursday. The Hawaii Dept. of Health will be holding Volcanic Ash and Vog Community Meetings tomorrow at Konawaena Elementary School in Kealakekua beginning at 5 p.m. and Thursday at Waikoloa Elementary & Middle School Cafeteria beginning at 6 p.m.
Tropic Care 2018 continues tomorrow with free medical, dental and eye care at Kea‘au High School from 8 a.m. until 5 p.m.